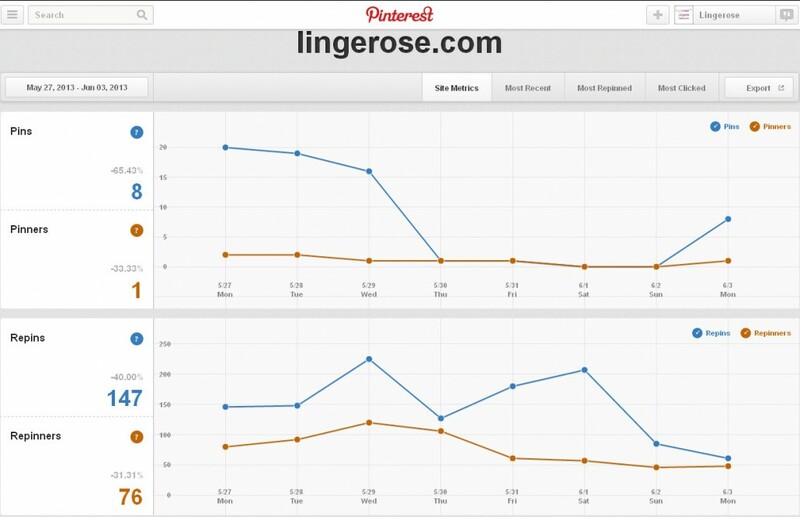 March, April and May were the months when I was creating a very strong account of Lingerose in Pinterest. As I gathered 1000 followers with no tools or any other illegal techniques involved, I was sure that both – Pinterest and Google appreciated my efforts. I decided to change the main strategy and to be more focused on the most effective actions, which would conquer Google and Pinterest search engines for good, rather than gathering some new followers. The Lingerose’s account was developed enough to do that. Day by day, I saw how Lingerose and its Pinterest boards were dropping down in Google search results. That day, in the Google U.S. Lingerose was classified at the 26th position – the day before it had been 3 positions higher. Pinterest’s boards dropped as well. I couldn’t afford testing that strategy any longer. But to be honest, I felt a little guilty because that action (or rather the lack of any actions) was against the aim of Pinterest’s campaign. I did it only for the research purposes. So, on the 3rd of June I decided to stop it. I didn’t add any new images or repin the existing ones for 5 days. Below, the picture shows the stats from Pinterest. Ok, so what’s the conclusion? 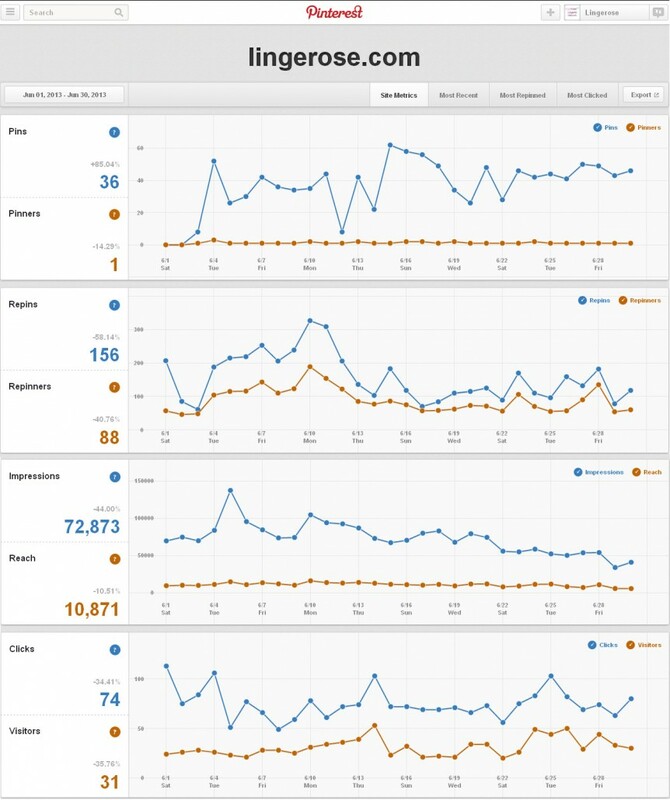 My assumption was to stop actions on Pinterest and to see if it may cause the Lingerose’s site and its boards get lower in SERP. In fact, they did. However, that test was held for 5 days only. To check if I was right, the best thing to do next was to start pinning again and to see if I could get higher in Google. That’s what I was going to do. I finished the test and started pinning and repining on the 3rd of June. 3 days later, I noticed the increase of Lingerose’s position in Google search results for the „lingerie wholesale” query. In the United States Lingerose was classified at the 18th position – that is 8 positions higher than 3 days before. From now on I will publish the results from different countries around the world. During the weekend (21-23th of June) I noticed some small decrease of Lingerose in SERP because the site was moved to the new server. According to that fact, DNS also changed and Google could have stopped crawling the site for a while. Search engines usually create one product carts when crawling e-commerce sites. There were no carts created between the 21st and the 24th of June. Fortunately, everything was ok back. As a curiosity, I’d want to mention what I once heard from my good friend – a CEO of some big SEO company. He said that the United Kingdom market is one of the most competitive ones and, personally, he wouldn’t start any SEO actions there – as he wouldn’t be sure to succeed.